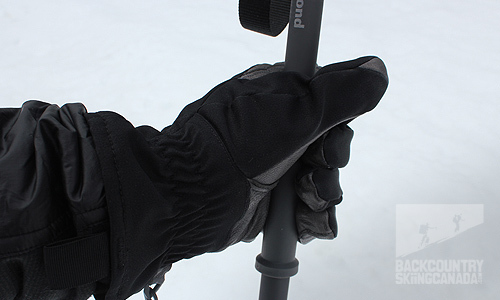 The 3-piece aluminum, Black Diamond Expedition Ski Poles are definitely upper class when it comes to collapsible poles. 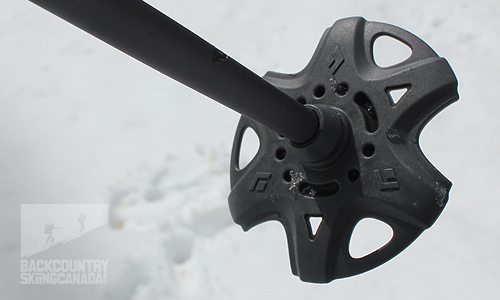 Built for the winter, the poles come with large powder baskets that maintain strength for hard pack and corn, and with stainless steel parts you’ll have no worries on coastal snow. 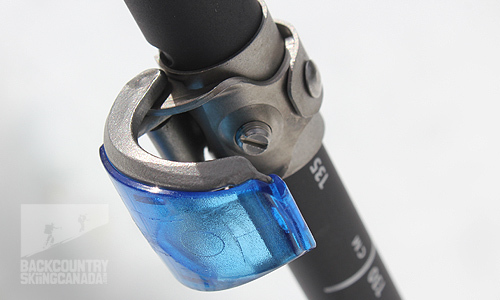 The FlickLock Pro clips are built with duel axis for added strength and having two can drop pole size in a hurry. 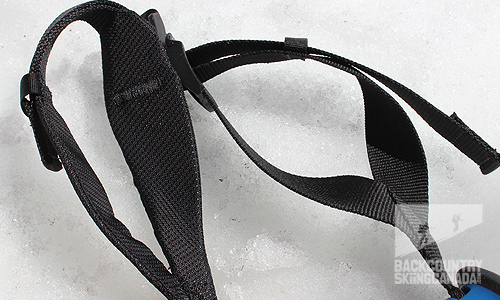 The wrist strap, along with the clips, are easily adjusted with ski gloves on, so don't worry about losing digits in subarctic temperatures. 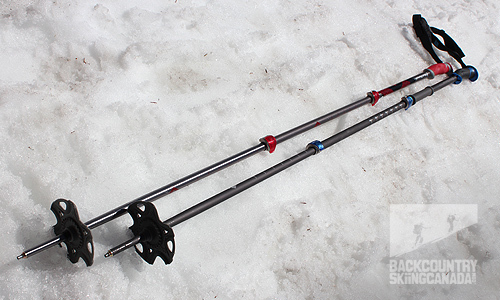 2012 (red) & 2013 (Blue) Black Diamond Expedition Ski Poles. 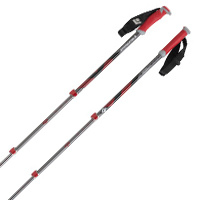 These ski poles are great for touring split-boarders as the 3 sections collapses, making them easy to stow in your pack. Also, it’s not uncommon to see these poles with the powder baskets replaced and used as trekking poles in winters off seasons. Large replaceable powder baskets for the deep stuff! Improvements made for the 2013 season include the addition of the lower, secondary grip for choking down in uphill mode. 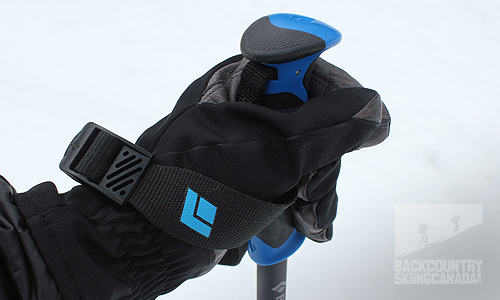 Black Diamond also swapped the Freeride grips and wrist straps for the Touring Series ones, which makes sense as the majority of its use will be outside of the resort boundaries. The grip has a solid pointed tip that makes buckle & lever adjusting a breeze without having to bend over and use your hands. The lower grip is great for choking down on the uphill. But beware of minor slippage. The 2012 Freeride Grip (top) has been replaced by he 2013 Touring Series Grip (bottom). Both have a durable point to assist with buckles and levers. They new 2013 version of the Black Diamond Expedition Poles remain lightweight and equally as strong (why fix something that isn't broken) and the FlickLock clips have duel axis for extra strength and a lower profile to reduce the risk of getting them caught on something. The 2012 Expedition's look a lot better with the red and black, argyle pattern. But it is function over fashion with the 2013 model. Thick to thin wrist straps designed for comfort and ease of adjustability when your hands are warm inside mitts or gloves. - Pointed Grip for buckles & lever adjustments. Low-profile, stainless steel FlickLock’s are durable and strong. 5cm interval measurements available on both 2012/13 models. The 2012 version in lock down mode. Equally collapsible and durable, the 2012 model looks sexier with black and red designs. 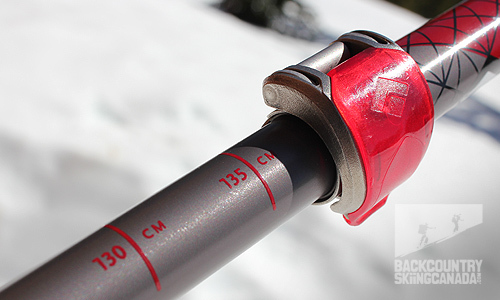 If you are looking for a collapsible ski pole that is relatively lightweight and durable then this is the one. All of the features I spoke of above are integrate to make this one of the best collapsible poles on the market, from a company you can trust. 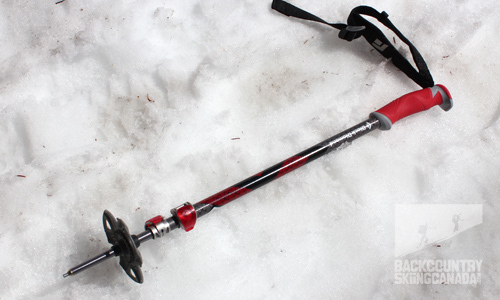 If you want to take it one step further I suggest paying extra for the Black Diamond Whippet Ski Pole which is essentially the same pole with an adze ice pick on top. - FlickLock clips are extremely sturdy and reduce slippage. Having two makes pole more collapsible. - Finish holds up well to scratches and nicks. - Comes with a fat powder basket. 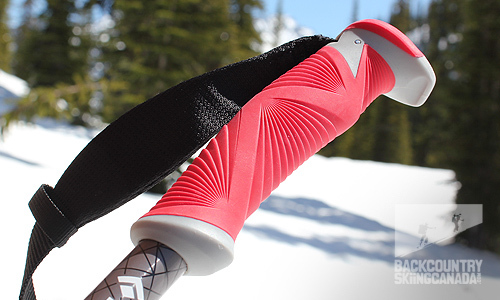 - Durable grip point that allows for use of flicking ski buckles or leveraging AT binding risers. - Straps are adjustable even with gloves on. - Rubberized second grip slips out of place easily and often as it is not affixed in place with any glue or adhesive. - 2013's are less aesthetically appealing then 2012's.